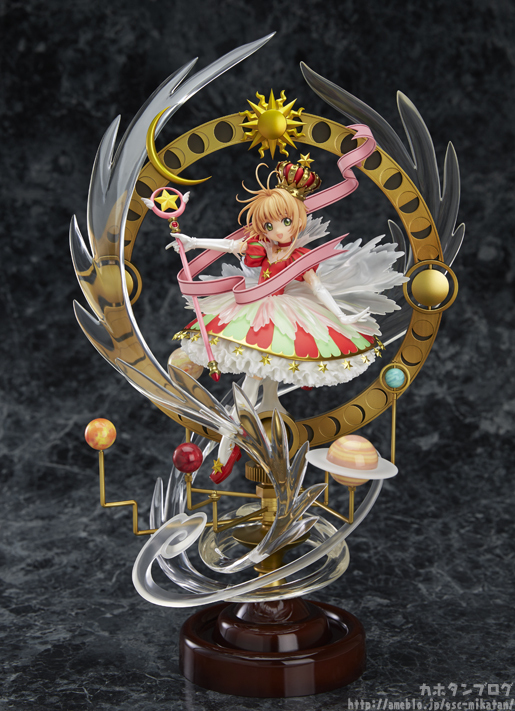 Good Smile Company announced via their official blog more information regarding the 1/7 scale figure based off an original Card Captor Sakura illustration drawn by CLAMP. 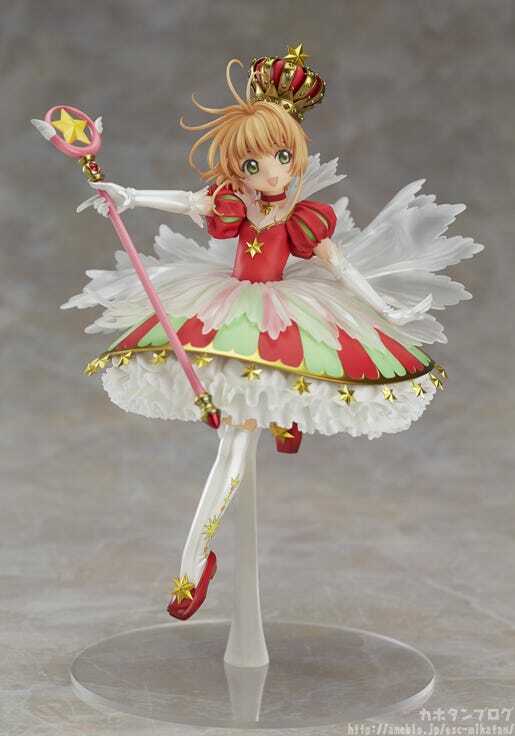 The figure is officially titled Sakura Kinomoto: Stars Bless You. Pre-orders will start tomorrow, July 21st, for the price of 25,000 yens. A simpler version featuring only Sakura will also be released for 14,000 yens. More information will be available on the Good Smile Company Official Website tomorrow. A special page with more information will be available as well. Make sure to check their blog post (in English) for the full details. Update: According to Dengeki, both figures will be released on June 30, 2017. I can finally breath! I know the price at long last! The last doubt I have will be resolved tomorrow: is it an exclusive release of GSC, or can it be purchased from other online stores? There are Amazon links (http://www.amazon.co.jp/gp/offer-listing/B01IR2PZV6?tag=dengekihobby-22) so I guess it’ll be available elsewhere. Question from someone who is not used to buy figures at all (this will be my very first): can I preorder it later? Like, closer to the release date? Or do I have to purchase it right now otherwise I’ll lose it? Well, it’s more like : why wouldn’t you pre-order it now since, anyway, you won’t be paying until the figure is ready to be shipped? ^^; At least, this is the case for GSC official store, and amiami. -in the case of GSC store, the pre-order period is limited > between the 21th July 2016 (Thu) from 12:00JST until the 7th September 2016 (Wed) at 21:00JST. Take in consideration that in the event order limits have been met, the pre-order period will end before the closing date. Payment will be processed as soon as the items are in stock, generally 2-3 weeks prior to the shipment date. -in the case of amiami: from what I’ve seen so far, they do not follow GSC periods, and usually, their figures are up for pre-order for FAR longer, but then again, I also witnessed that an item might stop being available for pre-order at literally any given moment. In the case of Amiami, when the figure is released in June, they will email you with the total amount (the figure itself + the shipping cost -you DO NOT know the shipping cost until that step-) and tell you you have one week to send the payment. The actual difference in this specific case: the shipping cost. Amiami will make you choose EMS too by force (because of weight/size) for a 19460 JPY (22% off) figure, but you won’t know the EMS cost until June 2017 which, considering it’s a 45cm figure, will be high. That’s exactly why. I could swear my credit card would be charged the moment I place the order. At least that’s how it is in most online shops. Take in consideration that in the event order limits have been met, the pre-order period will end before the closing date. So there IS a pre-order limit, then… scary. AmiAmi has 22% off so that’s even better ^^” I think I’m gonna order from them unless there’s a better deal? I personally ordered it this morning from GSC online store, something I usually don’t do, but in this particular case, they offer free EMS shipping and I like to know that the final price is 25000jpy. All in all, it’s pretty much a very similar price in the end, whether it is amiami or GSC! I see… I think I will ship mine to Japan (I have a friend living there) and I am planning to go to Japan myself next year where I can get it and then take it to Brazil with me, thus bypassing custom fees. Bypassing the customs + saving on shipping by sending it to a Japan address will definitely make you save tons of money! Around a 100usd! I hope so! That’s my plan… I hope it works. RE expensive CCS merchandise: Cutesherry, I think I remember you saying that you’re still hunting for the Poster Box released back in 2000, right? A complete set just popped up on Yahoo! Auctions for only 1000 yen. You can see it here. I was able to get my own copy for roughly 50 USD this way, so keep an eye on it if you’re interested!